For many football players, the choice to pursue the game as a living comes from a love of first playing it. And for those whose father played the game, the exposure at a very early age makes it something they want to pursue. Adam Konar of the Calgary Dinosaurs falls into the latter group. Like Adam, Kevin Konar was a linebacker. He played his entire eight-year career for the BC Lions from 1980-1989. His career was noteworthy enough to get inducted in to the Lions Wall of Fame in 2008. His son Adam is hoping to follow his father and make a career for himself in the CFL. Konar will most certainly be drafted and at least have a chance to make a CFL team this summer. 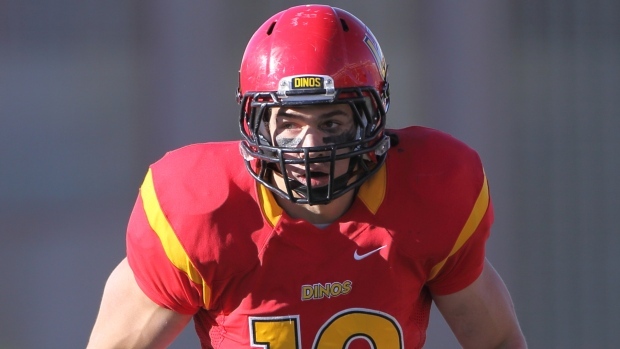 The Dinos middle linebacker had an excellent 2014 season with nearly 40 tackles, an interception and a forced fumble. He was named a first team all-Canadian in 2014 and made the CFL Scouting Bureau Winter Rankings Top 20, rated the 16th best college prospect in Canada. The route Konar took getting to this point was a roundabout one. He started playing university ball for UBC but after his first season was deemed academically ineligible to play. He went into Junior Football, playing in the CJFL the following season to continue playing the game. Watching all this was former Dinos coach Blake Nill. Nill would bring Konar back to the CIS in 2013 and the academic support provided by the school allowed him to keep his marks up. Along with being influenced by Nill, Konar also learned from former Dino players who have made the jump to the CFL. He lived with current Tiger-Cats defensive lineman Linden Gaydosh and current prospect and teammate Sukh Chungh. Konar said it was a funny house to live in but it also had benefits, especially now. At 6’2” and 225 pounds, Konar is a prototypical CFL middle linebacker. His former coach thinks CFL teams will like what they see from his former charge. Our next prospect profile will be on Montreal linebacker Byron Archambault, the 17th ranked prospect in the 2015 CFL Draft.